One of my priorities this year has been focusing on skin care. I wanted to reach a point where my complexion was healthy and glowing, and I was confident to go makeup free. I’m pleased to say I achieved that goal. Then I had a light bulb moment. Why was I putting so much effort into caring for my skin if I was going to cover it up with foundation? I love makeup. It’s an enjoyable pastime. I’ve reached a place where I’m very comfortable with my face with or without make-up and I never wear makeup because I feel I have to. I wear it because I like the ritual of putting it on and I like how it looks. But foundation was a product I overlooked. It had become such a part of the routine that I didn’t even consider it was an option to not wear it despite having no complaints about my complexion. Every time a bottle ran out I replaced it with a new one impulsively. It was either a no-makeup day or a full face day, there was no real in-between. Over the past few months the foundation I use has been getting lighter and lighter in formula, why not skip the step altogether? In case you're wondering, I've been using Perricone MD Foundation No Foundation and it's amazing if you need a little help covering redness or blemishes and smoothing out imperfections. Not wearing foundation has been a revelation to me. It's by far the biggest expense in my make-up collection; it costs money to buy foundation every few months but it also requires more cleanser to remove it. Overall I spend less time and less money by removing it from my routine almost entirely. I still keep a bottle on hand for special occasions but day to day I go without foundation - it's liberating. Here’s my routine and the products I used to get my complexion to the point where I can leave the house with a dab of concealer under my eyes and nothing else. I stuck to a minimal skin care routine based on skin condition (normal: slightly drier in winter, slightly oilier in summer) any issues I had (the odd spot, a rare break out) and I focused on using as few products as possible to achieve a clear, glowing complexion. 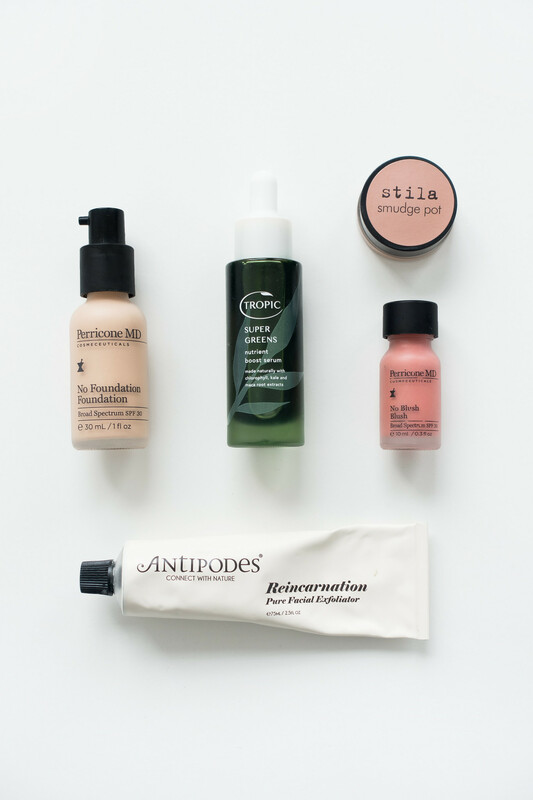 After a few months of focusing on the issues I wanted to fix (a bout of spots that just would not go away) and sticking religiously to the same products, I found a routine that worked and skin care products I could rely on. I use this serum in the evenings, right after cleansing and right before bedtime. A few drops massaged into a freshly washed face and I find, in the morning, my skin is fresh, supple, and hydrated. The vegan-friendly formula contains chlorophyll, kale, and mama root extracts to soothe the complexion and green coffee and tamanu oils to accelerate skin repair. I find this serum to be lightweight yet it takes a little while to be absorbed into the skin; allowing it to work overnight results in a glowing complexion. 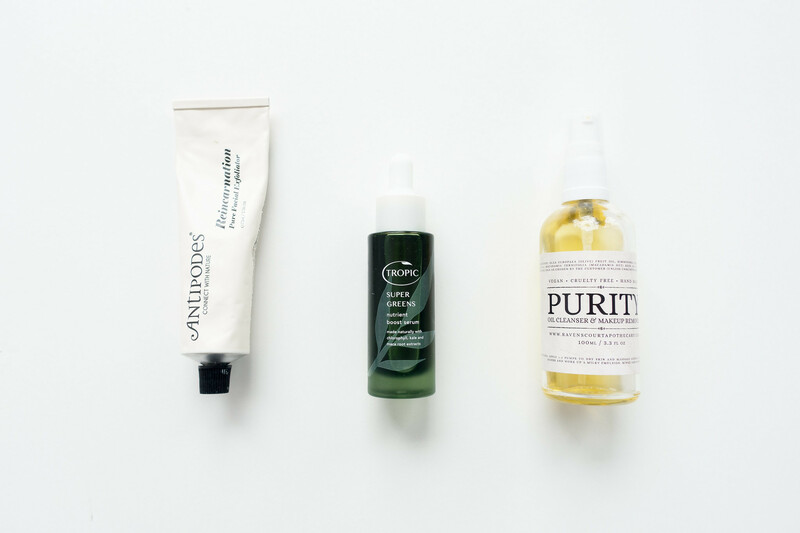 My skin is so hydrated I find I can get away without moisturising if I use the Purity Cleanser as part of my morning routine. I use this day and night. It’s a lightweight oil cleanser containing olive oil, macadamia nut oil, golden jojoba oil, and polysorbate 80; perfect for sensitive skin and available with additional essential oils to treat any issues your complexion might have. I opted for the unscented version and find it to be the perfect everyday cleanser. Massaged into the skin, the Purity Cleanser removes make-up and cleanses the face with its luxurious formula that turns into a milky emulsion to wash away the day's dirt and impurities. Whenever I use Activated Charcoal Soap on my face I find it clears up any issues I’ve had with breakouts or blemishes in a gentle, effective way meaning I don’t have to resort to using more intensive products. I only use this product on my face whenever I’m experiencing issues with my complexion. There’s no fragrance or colorants so no risk of irritation and the activated charcoal helps keep blemishes and redness under control. Depending on how my skin looks and feels I’ll exfoliate a few times per week. The blend of avocado oil, jojoba beads, calendula oil and carrot seed extract in this manual exfoliator helps to lift dirt and soothe the complexion. I find my complexion always looks healthier when I regularly exfoliate as it aids skin regeneration providing a brighter, fresher appearance. If my skin is feeling clogged and my complexion looking dull I treat it with the Perricone MD Chloro Plasma face mask. I do this once every fortnight and find my complexion is clearer, brighter, and healthier in appearance. The formula is designed to improve radiance and skin texture, minimising enlarged pores, detoxifying and purifying the complexion. It’s a gentle clarifying mask to deeply cleanse without irritation.